‘In many ways, Frantz Fanon has always been a part of my life. Even today we face the unfinished business of Arab revolutions and religious fundamentalism – these are themes that Fanon tackled at an earlier moment, and that still resonate.’ – Isaac Julien, from the essay Mask, which was first published in Isaac Julien: RIOT, Museum of Modern Art, New York, 2013. 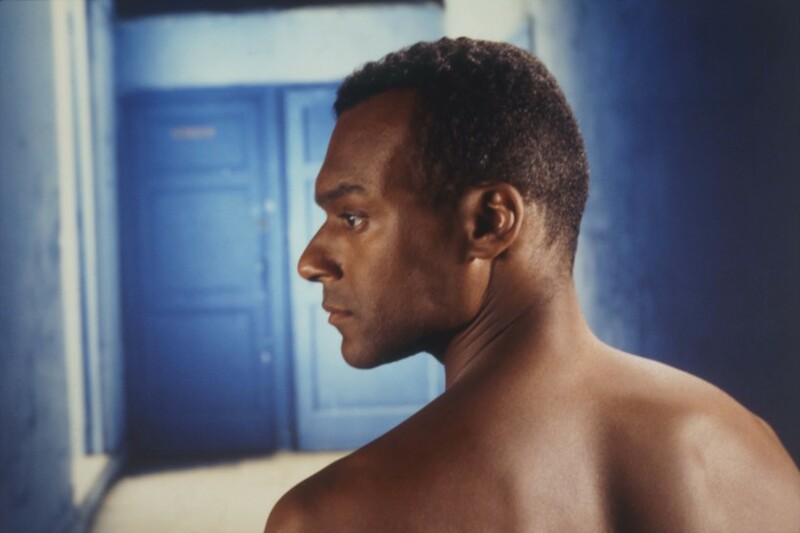 Isaac Julien and Mark Nash’s Frantz Fanon: Black Skin, White Mask (1996) is a film portrait of the revolutionary, writer and psychiatrist, whose classic publications The Wretched of the Earth (1961) and Black Skin White Mask (1952) remain the bibles of decolonisation. One of the leading black intellectuals of the twentieth century, Frantz Fanon (1925-1961) trained in psychiatry in France. He explored the ‘black is beautiful’ Negritude movement and entered into a dialogue with Jean-Paul Sartre about the experience of being black. He wrote his first major work, Black Skin White Masks as his graduate psychiatry thesis, focusing on the psychological interdependence of the colonised and colonisers, with particular reference to the French colonies. He was later appointed to a clinical post at a major psychiatric hospital in French Algeria where he observed the violent colonial subjection and its psychic consequences at first hand. In 1956 he resigned his post because of the French policy on Algeria and was expelled by the French authorities because of his sympathies for the liberation struggle; this prompted him to join the Front de Libération Nationale (FLN) and give clandestine support to fighters in the maquis. Fanon moved to Tunisia where he became the Algerian Government in exile’s (GPRA) Minister of Information for Sub-Saharan Africa. He also wrote for the FLN paper el Moujahid. In Tunisia, Fanon shifted his thinking from the psychology of race to the necessity of armed struggle to overthrow colonialism and institute authentic subjectivities for black peoples. He represented the GPRA at the 1960 All Africa People’s Conference in Ghana, Accra, where he discussed setting up a second front in the Algerian War. He died in 1961, just before The Wretched of the Earth, his ‘primer for third world revolution’ with an incendiary prefatory essay by Sartre was published and just before Algeria finally achieved independence. In Isaac Julien and Mark Nash’s film, scenes from Fanon’s life as imaged in his writing are strikingly reconstructed. Colin Salmon brings Fanon alive to a contemporary audience through his enigmatic performance, conveying Fanon’s thoughts, actions and desires. The film combines the poetic visual intensity of Julien’s award-winning Looking for Langston (1989) with its mix of archive and dramatic reconstruction and visualisation, with an acute analysis from interview and commentary by those personally and intellectually close to Fanon. Interviewees include the late Stuart Hall (1932-2014) – the pre-eminent theorist of cultural studies – French and Algerian intellectuals and Fanon’s brother and son, Joby and Olivier Fanon. Frantz Fanon: Black Skin White Mask brings us face to face with the ambivalent identifications that the racist colonial and postcolonial worlds offer their subjects – not only of violence, hostility and aggression but also of desire. The film focuses on two key elements of Fanon’s thought relevant today: the racial encounter between black and white, coloniser and colonised, and the issue of nationalism and violence. The film dwells on Fanon’s unique insights which may help us understand and combat the destructive effects of racism and fundamentalism which continue to affect many countries today. In the half century since Fanon’s death, Africa has become completely decolonised, politically if not ideologically, yet the questions Fanon poses about race and colonialism are still the most pertinent to understanding the problems of postcolonial societies and subjectivities in the ‘first’ and ‘third’ worlds. The film traces the trajectories of these key debates, which were first articulated by Fanon in his life’s work. Frantz Fanon: Black Skin White Mask was shot in a studio in London and on location in Paris, Martinique, Tunisia and New York. Research on the project was guided by Françoise Vergès in Paris and Lucien Taylor in Martinique. An original soundtrack was commissioned for the film from the Axiom Foundation; Tunde Jagede and Paul Gladstone-Reid, whose music combines African and classical influences. The film was shot on Super-16 and digitally edited. It was originally released on 35mm in 1996. For this newly conserved version the producers went back to the original negative, and reconstructed the original film on High Definition with assistance from the BFI’s Unlocking Film Heritage Fund. This restored version is now available on Blu Ray and DVD from the British Film Institute.